So I’m not one to complain much as I tend to be very patient and easy going but I needed to post my frustrations in this case. The estimated delivery time kept getting pushed further and further back as Esprit had some mold problems with the wing stands. The process was long but the Wing Arrived in October 2017, so almost exactly to the day 12 months. I excitedly opened the box and was going to mount the wing but noticed that the stands themselves were matte and not glossed. I figured buying the glossed version would include glossed stands. But I was wrong. So I installed it, it looked great, and I loved it! So I still cannot enjoy it yet as my transmission was acting up and I didn’t want to damage it further. I dropped the car off on March 21st (so not one day outside) and didn’t pick it back up until April 30th. This whole time it was stored inside an enclosed building and never sat outside. I drive my car at least 5 days a week, generally to and from work and while running errands, it sits outside w/o shade between 8am to 5pm and it is garaged nightly, it sees rain but if there’s chance of hail or bad thunderstorms then I take my truck. On Monday May 21st, I noticed some cloudiness on the front underside of the wing (not the top, not the sides, not the mounts, or the back underside) while I was washing my car as it had rained a few days. I tried some water in a microfiber towel and that didn’t remove it. So after 22 days my wing was fading already but underneath? I was gone for a week for work, so that’s 17 days including weekends which most of the time we take the FRS or truck due to our dogs. So my first instinct was maybe it was the soap that I washed the car with that it didn’t like, but still why only part of it? Because how would this happen to a coated wing in under 3 weeks. I ordered an Esprit 052W GT Wing from you (went through Jon, this email) in October 2016, I received it in October of 2017, had you guys make custom stands/clear the mounts received and installed on March 12th, 2018, then my car was in the shop for it's transmission until April 30th. So it hasn't been outside all that much and the Gloss Carbon on the wings underside has become cloudy/hazy. I can send photos in a couple hours while I'm on my lunch. Is there a specific method to attempt to remove this or will the clear coat need to be removed completely to get the cloudiness out? I waited so long for this wing and have barely had it on the car 2 months (1 actual month of use, always garaged as well) and it's giving me issues. I received a reply from Avi Fischer asking for detailed photos both up close and at a few feet of distance. I had our team here review the photos… this appears to be cloudiness in the gel coat from Esprit. 1. Are you sure we clear-coated the wing? I see about 100 emails back and forth between you and Jon but in scanning them I did not see anything about clear coating the wing. 2. Is it ONLY on the underside of the wing? I do not think Esprit cleared the wing (they don’t ever do that). I think what happened is that the wing is wet carbon and the stands are dry carbon. The wing was probably just raw gel coat (which looks glossy but has no UV protection). A body shop should be able to sand out most or all of the cloudiness and clear coat the wing which should keep it from reoccurring. When I talked with Jon he said it was UV protected from Esprit and the wet vs dry carbon is actually glossy vs matte and not the carbon itself, and that I wouldn't need to coat it. Otherwise I would have had you guys do an extra coating on it, plus if it was the UV rays why would it be happening on the bottom front edge of the wing, and not the top first. As I've seen carbon yellow before on other cars and it's always on the top. I have a cheaper APR carbon splitter on the car the gets direct light and has zero problems. Any chance you can dig up the emails in question? Your description of what Jon told you seems wrong and I would just like to try to see what he said before I come to the conclusion that he misinformed you or worse. 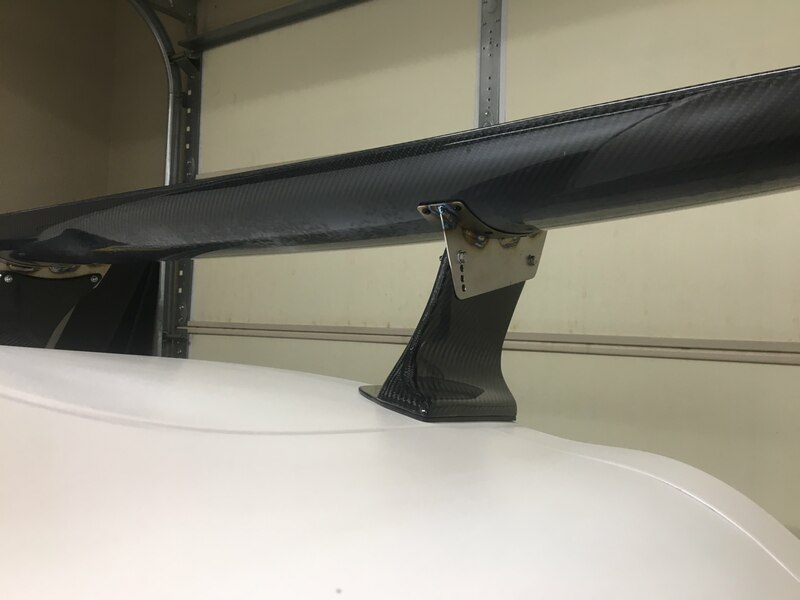 Esprit can only make the stands in dry carbon due to strength requirements and they offer the main wing section in wet or dry but the wet is nearly half the cost. None of their stuff ever comes clear coated, nor do they even think it matters since they are “race parts” and they don’t care about the esthetics at all. As for why the bottom of the wing? I have no idea but I’m wondering if there is some reflection issue that may be worsening it? It’s hard to know without seeing the wing in person. I'm trying to search all the emails but it was discussions for almost three years on the wing (prior ordering, during, and after) and a lot of it towards the later stages were via text as Jon is good people and we still keep in touch. I'm not one to keep my text messages forever. If it wasn't clear coated I'm not sure how it'd not be mentioned to me to get it sealed prior from the shipment from Bulletproof to me as I know there are multiple of these wings on your Overtake builds and haven't seen any issues with those let alone within a month of having it on a car. Which I would have had you guys do, as I didn't wait 18 months to get this wing to have it decay in under 30 days. I'm not sure I can have this fixed locally as you guys had so much difficulty in coating the stands that it took almost another month and was about to be outsourced to Moses in Florida who had coated Esprit parts before. As Jon and your carbon fiber tech said the Esprit carbon is notoriously hard to coat. Not sure about the reflection as the car is plasti-dipped a pearl white, so it's not super glossy nor a mirror like surface. “I wasn't able to find anything related to UV protection or coating in email, it must have been via text... But I know I asked if I needed to do anything special to keep them in good shape as my vehicle is my daily as well as tracked. And I was told nothing else was needed other than regular cleaning. Hence I thought it was UV protected but you're now telling me the Wing is not. So I don't have many options other than trying to have it fixed. But based on how hard it is to work with Esprit carbon my car is going to be down again and more money out of pocket for me as I am trying to focus on planning my wedding and honeymoon. I thought my car was good to go as I just got it back and started enjoying it. I totally trust you but from my side I have to hope that there was a misunderstanding between you and Jon rather than Jon intentionally misleading you. I’ve never heard of him or anyone else doing that kind of thing. Having this situation happen does not help any of us. 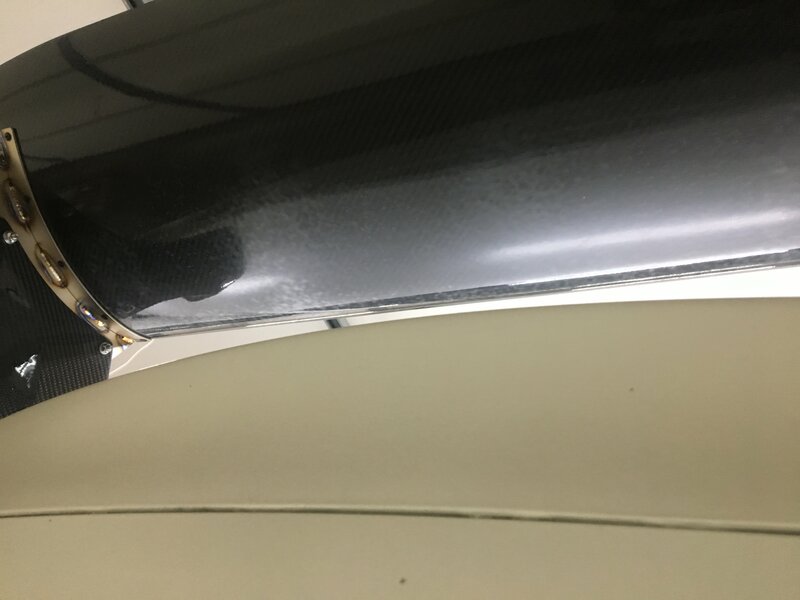 If you want to send the wing back we can take a look at it and see if we think we can repair it, but you may want to have a body shop locally that has experience with carbon take a look first. It might be a relatively easy fix. There must have been a disconnect as I know Jon wouldn't intentionally mislead me. 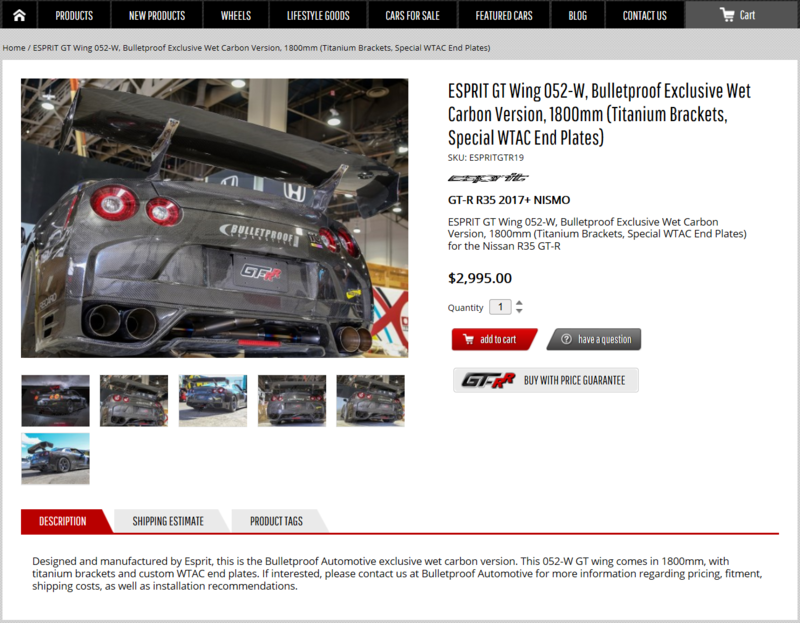 I just don't see how this major detail with lack of UV Protection isn't on the product sell page (http://www.gt-rr.com...wtac-end-plates) Or at least a recommendation on the sale page stating you should UV protect this item upon receive or ask us to do it, etc. I'll look around but I don't think there are any body shops locally that have dealt with Carbon fiber as there aren't too many high end performance shops in the Mid West let alone ones that are close. How long would it be if I sent it back to you? And would it cost? If I get it done locally would BP help the cost as well? I appreciate your suggestion but virtually no carbon products come with a UV clear by default… usually it’s a very expensive up-charge from the vendor if they make it available at all. It’s the same as FRP unpainted parts, the manufacturer expects professional installation and (clear) paint.. It’s not a perfect analogy but if you put wooden furniture outside in the sun without some kind of sealant it will decay quickly in the sun and the manufacturer will feel no responsibility for that damage. I will try to implement a process to better communicate this to customers. If you send it back to us we can inspect it and go from here. If we feel it is repairable we would repair it at no cost, but I will not commit to any course of action until we see it. I've had APR and Seibon on both my prior car (Camaro) and the GTR, and have never had any issues with UV fading. I've also had MDI Carbon and Ilmberger carbon products and I have purchased cheaper carbon parts from various eBay outlets with no issues on my car or my fiancee's bike. The fading is exclusive to the Esprit wing. None of those parts required an up-charge to be coated, it's how they came. And when asked if they needed to be coated after receiving all companies stated that they were coated. I understand the analogy on the wooden furniture but you'd know immediately that you were buying unsealed wood, as it would be straight wood and not any other color/shade. It would also feel different. 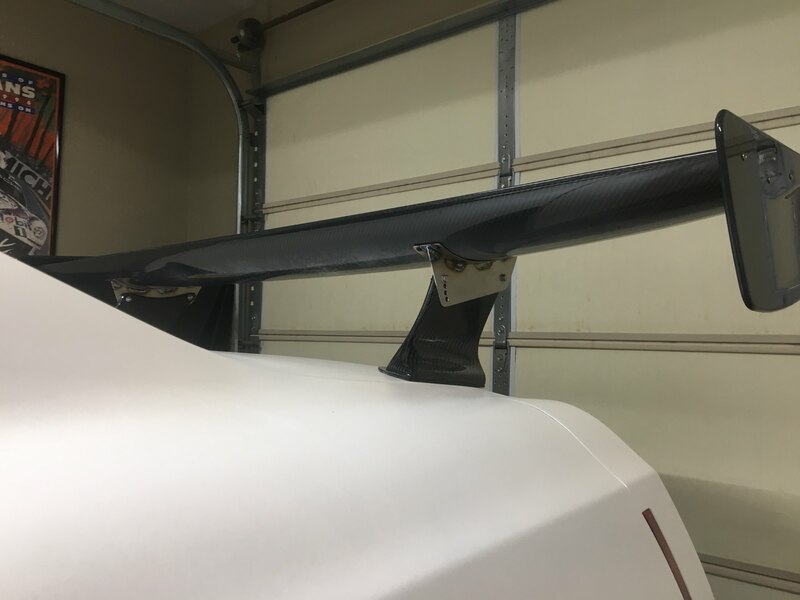 The wing that I received both looked and felt like all other carbon parts I have received, leading me to believe that I had received a protected part similar to all the other vastly cheaper parts that I have ordered. I don't think the analogy works in this situation. I am not interested in paying to return the wing to you. If you provide shipping costs, I still would be uncomfortable with moving forward with Bulletproof without the guarantee that it will be fixed- and fixed within a timely manner, based on the long cycle time to fabricate and coat my wing stands, which took six months. 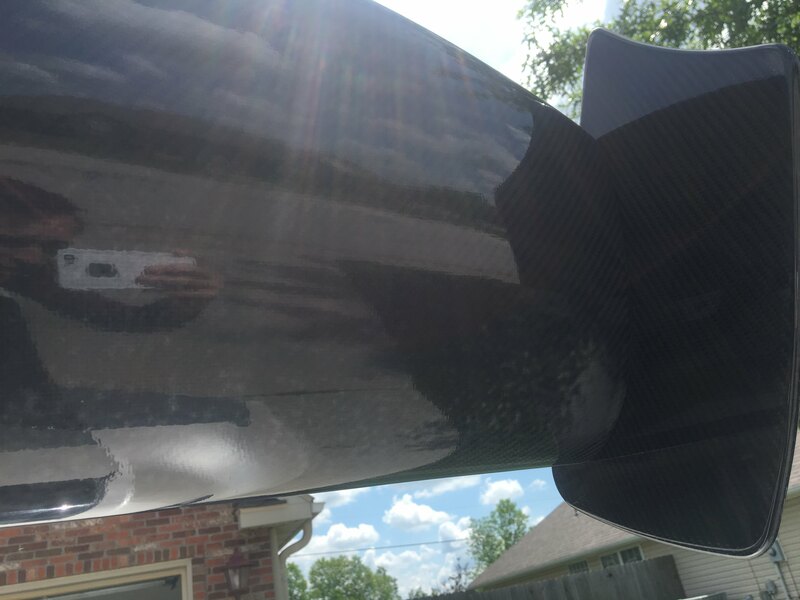 I've received a quote of $500 from a local shop to fix the issue within a week without the shop seeing the wing. Due to Bulletproof's failure to inform me that the wing needed coated, which I would have happily paid for at the time, I think the most logical route would be for your company to cover these repair costs. I appreciate the fact that you had good experiences with carbon in the past. While we don’t sell Seibon and we don’t recommend APR, you will see hundreds of examples of customers that are not so lucky with those brands. I will raise your concerns to Esprit but I am 99% sure they will consider the issues related to improper installation given that the item was not clear coated. It’s impossible for any shop to guarantee a result in this case. 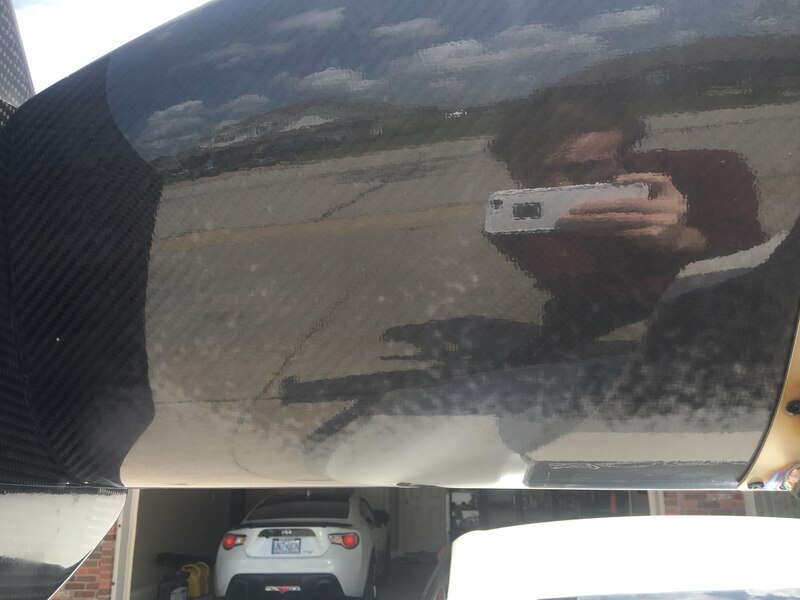 I recommend that you look for a body shop locally to see if you can find someone with experience with carbon fiber to get a qualified opinion before you consider shipping the item anywhere. I understand that there is the normal wear of carbon parts over time, but both examples you sent explicitly state that the fading occurred after 1 year and 2 years respectively. I take necessary precautions to stretch the lifespan of the clear coat as long as possible and have parts that have been on upwards of 3 years without any fading. 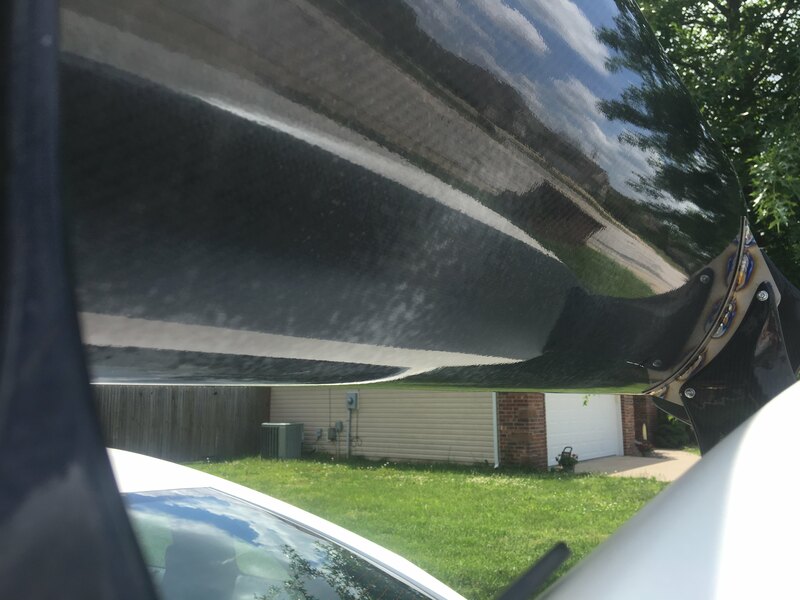 The wing I received faded within 17 days of install. The car is always garaged so it's doesn't spend all day out in the sun, and aside from that it's on the bottom side of the wing. 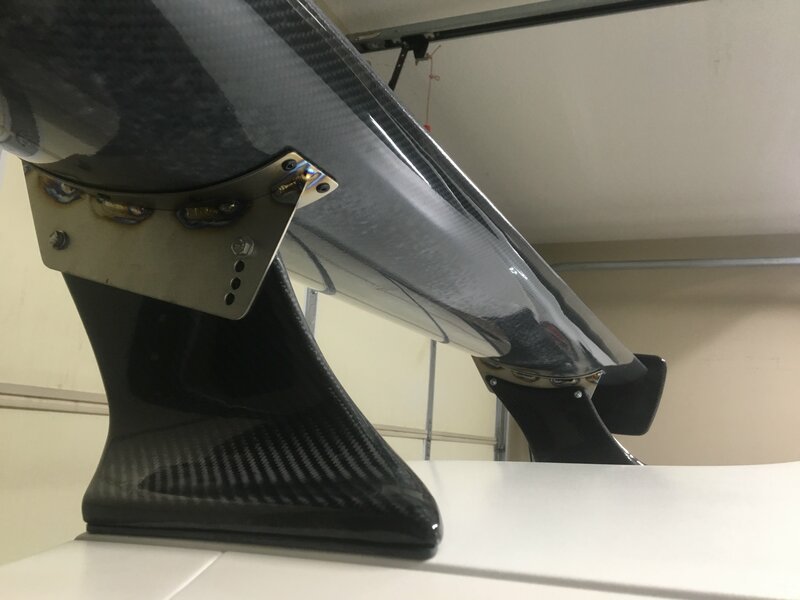 The shop I've spoken to is experienced in carbon fiber, and I intend to take it there this weekend to inspect the wing (2 hours away). I don't believe the failure was on the part of Esprit, the failure was on the side of BP, as BP should have made it clear that the part needed UV protection on top of the clear coat from Esprit. Again, there was no reason for me not to coat it, aside from that I was told that it didn't need to be coated. Yes it is a car for the road course, but I also drive it outside of the track and aesthetics are important to me. I would NOT have opted to skip the coating to save money after already spending so much on the wing. I think the most logical route is for BP to cover the cost to repair the wing. I understand that there was miscommunication. 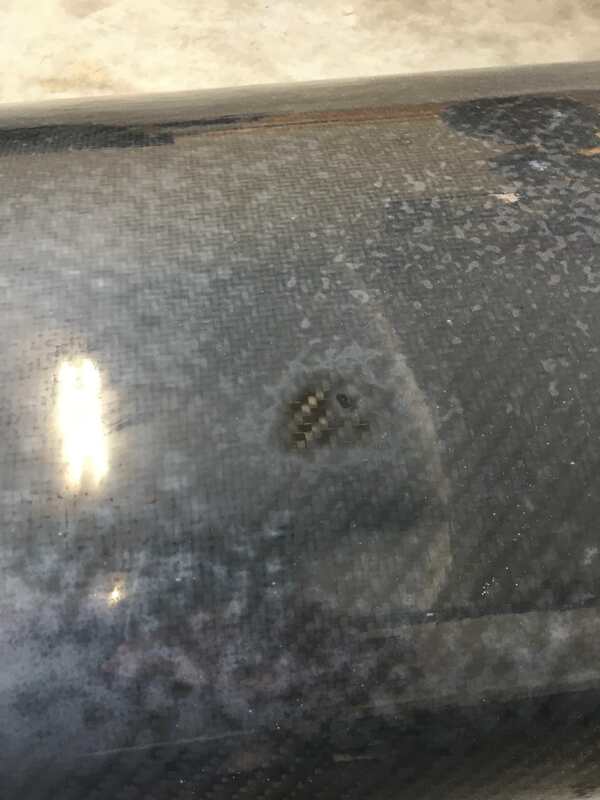 It’s still unclear to me how or why Jon would have told you not to clear coat the wing… we strongly recommend clear coat to every customer who orders anything carbon and we will not install carbon parts here unless we clear coat them. I appreciate you going out of your way to get the wing looked at but the cost of driving 2 hours seems to potentially outweigh the costs of shipping it to us, might it not? That 2 hours is also the direction of visiting my family so there is that and for two and from gas would only be $60-80 or so compared to boxing/packaging/mailing the wing. Sounds good. I just want to make sure it’s not a huge burden to get it looked at. Wanted to reach out, the local shop just finished on my wing. Took a while to get my wing in, and then took two weeks for them to even get to my wing. They said looking at it that they’ll be able to fix it but they didn't get it all out. They wanted to pain the bottom portion of the wing to cover it up but I told them no as I don't want my carbon painted over plus a gloss black wouldn't match my paint scheme that well and what would be the point of a carbon wing at that point? I haven't picked it up yet or seen it in person but these are the two photos that they've sent so far. It does look less cloudy/hazy but it's still there. Just wanted to let you know. Well the shop that was local that was "confident" they would be able to fix it strung me along for 5 weeks. The first week I get that they were busy but the next 4 it was excuse after excuse. Finally I told them I was picking the wing up after they said they couldn't fix it and wanted to paint it black. They did nothing to it. Maybe one spot they attempted and realized it was either too much work or they didn't want to. I bet the wing was sitting on a self somewhere as it looks like nothing was done to it. They originally wanted me to drop the car off with it, probably would have just used it for joy rides. Thankfully I hate having this car out of my possession. I’m just very frustrated now as I finally had my car in complete working order and now this! Plus nowhere in the sale add for the wing (first image) does it say that it is not UV protected and I was never made aware of it. Otherwise, I would have had Bulletproof coat it prior to shipment to me. Because why would I risk the most expensive body components looks? And I wanted the community to know. Haven’t heard back from Bulletproof since my last email. I figured I would post my experience so far. It's been awhile as my wedding is in 12 days so life has been hectic and meanwhile trying to trouble shoot an AC issue on my car as well. But not the point of this post. Many many reviews just like yours or worse out there about bulletproof unfortunately. Ive met Ben before and hes super nice..but i think he may not know a lot of whats going on at his company. A lot of high end dry carbon doesnt come cleared unless specified. On that note- bulletproof usually places the order and part is drop shipped from japan or they charge shipping from japan to CA...unload it..charge you an addtional shipping fee...then send to your house. Im almost positive noone ever did a quality check on your wing. Ive ordered from bulletproof 5 or so times- including special ordered top secret ti pipes that i paid extra for that came in wrong after almost 8 months of waiting...then when i said theyre way wrong (were hot pink!) i got “well they are a one of a kind product now...we cant refund your custom color $200 upcharge but next order youll get a good discount”. Next order they had no idea what i was talking about. I also received other peoples parts in the mail from japan they clearly didnt open the box to know wasnt right parts going to me. I like what bulletproof does bring real jdm to usa..but they have to know there are MUCH better and MUCH cheaper avenues to get the same parts- i order all the time direct from japan- usually have the parts faster than when ordered in the us. Yeah, I'm done ordering through them based on this experience. Never have I had an issue like this through Vivid, Evasive, any other shop. Contact Moses at CarbonSignature..... he has repaired a ton of CarbonFiber yours would be a non-issue for him, he has done some magic with some cracked, and otherwise useless carbon fiber pieces that many would have otherwise thrown in the trash. check out his facebook page as well for some of his work, pretty incredible stuff. Thanks sent him a note, maybe it can get fixed while I'm on my honeymoon in September. oh man, I feel for ya, Geoff. I would be SO PISSED off. Good luck, and let us know how it turns out! No word yet from them, I followed up this morning. How did this end up for you - never saw any update. I ended up getting swamped with my wedding, then my honeymoon. I've been back 8 days. "I reviewed your photos from the link, we can certainly assist. We perform several repairs/restorations in addition to producing our own products. Feel free to check out our fb and Instagram links in my signature below for photos of our work. We would need the wing shipped to us and depending on how deep the oxidization/blemishes are could vary in the cost. But based on the photos and his past experience with Esprit items I have high hopes that he'll be able to make it perfect once again. "if" you wanted to get technical, and based on advertising laws in CA (bait and switch) - if a company shows a product - and you buy said product - THAT is how it should arrive.